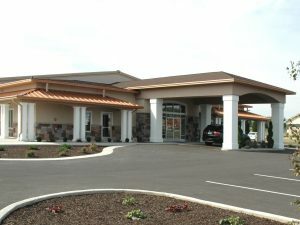 If you’re getting married in Racine, Infusino’s should definitely be a place to check out! With an expansive banquet space and great food, they make it easy to have a perfect wedding experience. 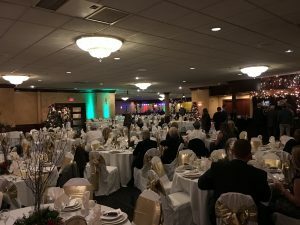 Infusino’s Banquet Hall…It just keeps going! 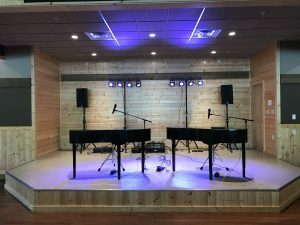 Racine, located in South East Wisconsin, is actually a city that has evaded our dueling pianos show for sometime. Despite one of our players growing up there (Joe Kennedy), this wedding was our first in the area, and therefore our introduction to Infusino’s. 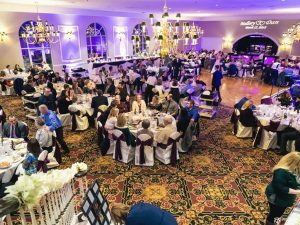 With an adjacent restaurant, Infusino’s offers a large banquet room that can accommodate almost any size wedding. And with multiple bars set up and a stage with dance floor, it’s a perfect venue for entertaining. Combine that with an Italian wedding and amazing food and you can’t go wrong. 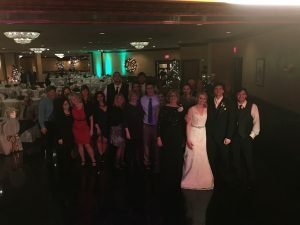 Our couple decided on a dueling pianos wedding band due to our high energy and interactive show, and this crowd didn’t disappoint. From covering Rat Pack tunes during dinner (again, Italian Wedding), Louis Prima requests for Grandma, and dancing till the end of the night, the wedding was a blast. But when they serve drinks at the front door before you even enter the reception space, it’s kind of a tip that the wedding is going to be exciting. This couple opted for an uplight package, which I always recommend to “up” the look of the space. 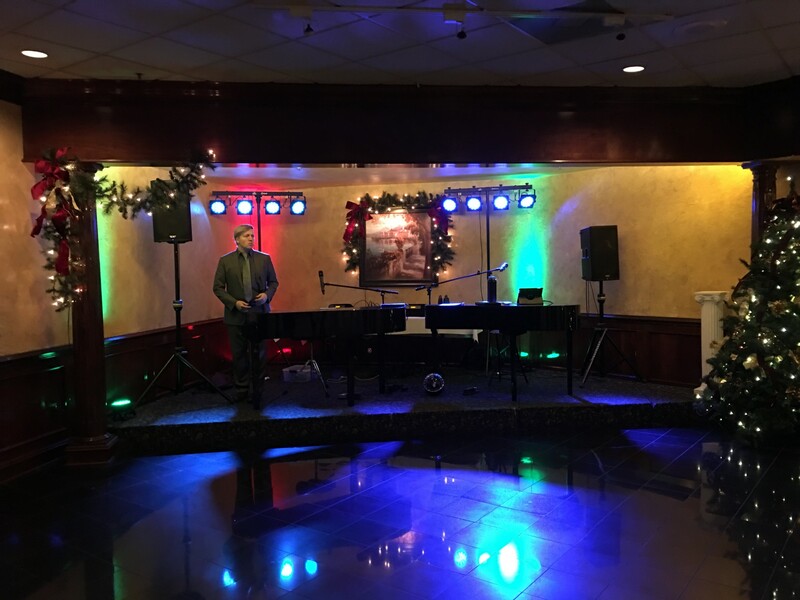 Lighting is everything when it comes to ambiance, and the uplights on stage helped to create a much more inviting feel to the dance floor. Another nice feature at Infusino’s was the ceiling speakers. 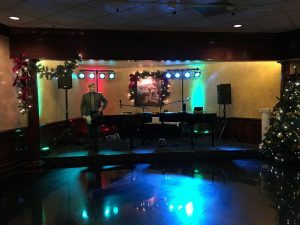 Having professional musicians at an event can help when they have the cabling and adapters to plug into house sound system, especially in such a large room! When you have 250+ events, ceiling speakers really become an amazing help. If you have an upcoming wedding in SouthEast Wisconsin, I’d recommend checking out Infusino’s. It’s a great venue for a wedding, especially for those families with Italian roots. We hope to be back soon and definitely want to hear about your event plans! For a free quote, simply fill out the form below or contact us here!